The New York Times Best selling author, Tim Ferriss, recommends very few exercises in his book “The 4 Hour Body.” Among these exercises is one of my favorite full body moves, kettlebell swings. This movement has the ability to target all of the large muscle groups in your body for maximum calorie burning in a short amount of time. It’s also considered to be a “power move,” which promotes explosive movement, another key for increased calorie burning. 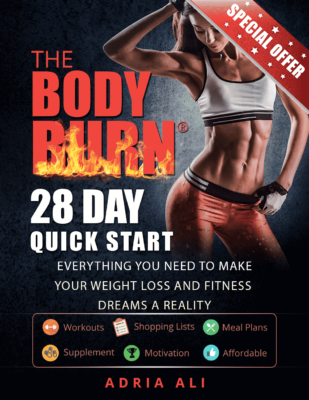 If you are looking for exercises that burn the most calories in the least amount of time, here is Fit Tip Daily’s Fat Burning Formula …. Full Body Exercises – Exercises that encompass your whole body (upper and lower body). Power Move – An explosive move (usually defined by quick movements) that loads muscles before they are released, similar to a spring loading and releasing. Examples: wood chop, Olympic lifts, medicine ball exercise where the ball is thrown at the wall etc. Functional Movement – Any exercise that takes advantage of a 3 dimensional atmosphere and move through out space. These typically DO NOT use machines. Losing weight and getting in shape isn’t about working harder in the gym, it’s about working smarter! Preform exercises that make a that help you to burn the most amount of calories in the least amount of time. Simplify your life and your choice of exercises so you don’t become overwhelmed. Using full body, functional movements, mixed with a couple power exercises can get your the results you desire in less time! Our equation for fat loss is the key to successful calorie burning .. share it with your friends, family and coworkers using our link (blue bar) at the bottom of the page. Fitness is contagious, keep the fire burning and pass it along!